How sweet is this!!!? 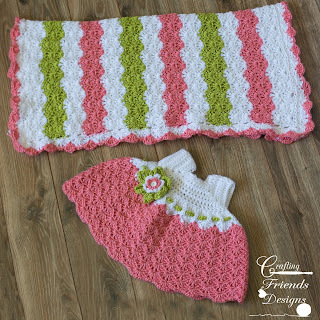 Sandy's Cape Cod Originals is offering her Doggie Toy Lovie Blanket crochet pattern to all of us for free. This is a great way to find new designers and see how you like their writing style. Grab your copy today, work one up and maybe you'll love it enough that you can make a bunch of them for service projects. I bet that Homeless Shelters or Women's Shelters could both use some of these to brighten a little child's day. 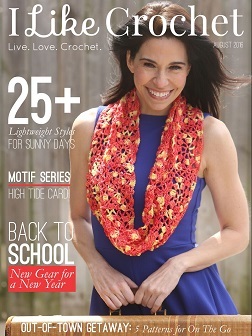 4 years ago, I started writing patterns and designing some of my own crochet things. 2 very different things. 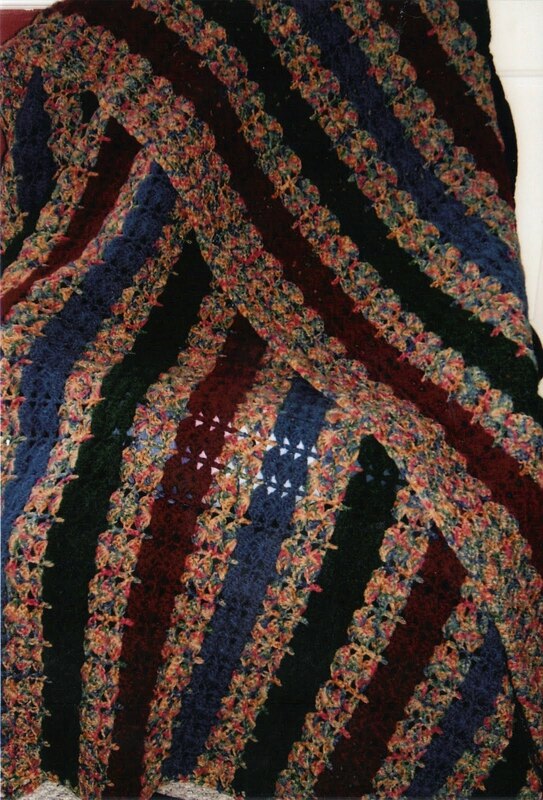 I wrote some patterns for afghans using basic crochet stitches such as my Brick Stitch Afghan and my Shell Brook Afghan. 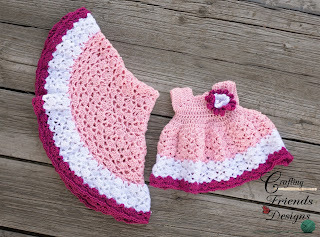 I didn't really "Design" them because they were just the stitches in straight rows and I just figured out the sizing and wrote the directions down. 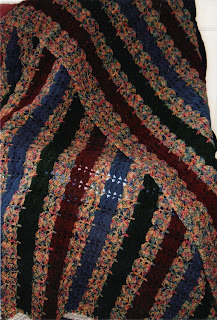 They are very pretty afghans and I've made MANY of each of them. 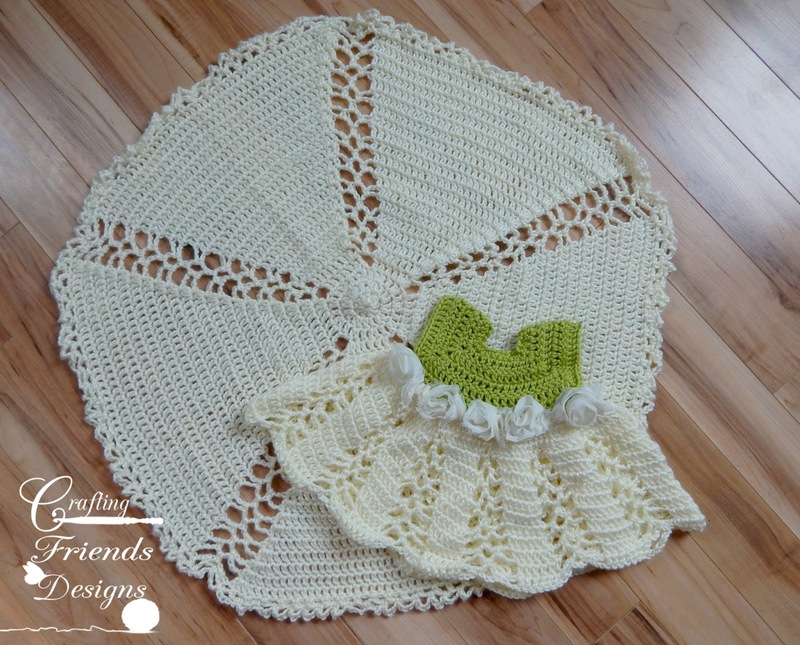 Baby Tay, Shell Brook, Diamond, Ribbon & Lace, Oh Snap and Snap Dragon. 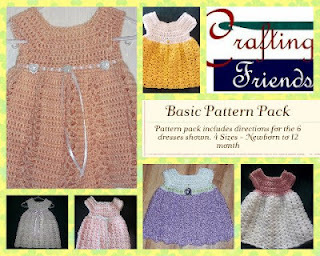 I wanted everyone (even beginners) to feel accomplished by being able to make their own crocheted clothing. I posted some photos of just the dresses on FaceBook and the Ribbon & Lace dress (the peach one on the far left) was shared by AllFreeCrochet because they really liked it and I was blown away by how many people were interested in the patterns. 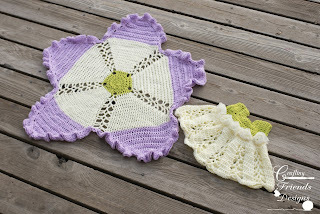 It was a long few months of actually writing up the instructions for others to be able to follow, having around 20 wonderful ladies test 4 different sizes in all 6 designs. The patterns worked!!! The dresses others made using my instructions were really pretty and I was so happy to have such a great response! Fast forward 3 more years and WOW have I learned a LOT! I've changed my writing style some and have worked with 4 amazing Professional Photographers in order to show my work at it's best. I owe a HUGE thanks to Nicole Nelson Photography, Ash & Co, Violet Lufkin Photography and Two Color Photography for working with me and their beautiful talent. As I looked back at these 6 original designs, I knew I needed to update them. I dreaded it for a while because I remembered working up each size dress myself along with the ladies testing. I had SO many dresses around my house (they are addicting!). However, once I jumped in to start the updates, I found it refreshing and fun and inspiring. I decided I wanted to do more than just update the dress. 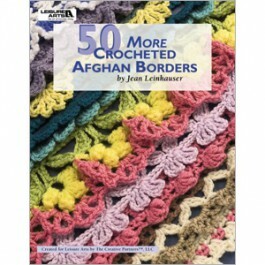 I wanted to improve the value of each design so I added new flowers to some and coordinating afghans for each one. I use Caron Simply Soft yarn for my dresses though you can use other similar yarns such as I Love This Cotton. I also use Boye crochet hooks, so keep this in mind when working your swatch for the gauge. Different hook brands can alter your finished size if gauge is not met first. Now that they are all complete, I couldn't be more happy and in love with how simple yet beautiful each one is. I hope that you will enjoy them even more than before! 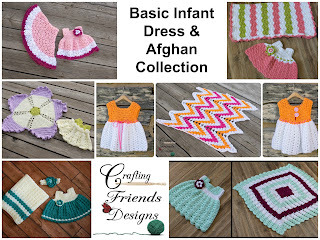 They are fantastic gifts for Baby Showers and each afghan (except the Flower afghan) has instructions to make in your desired size and is not set specifically for infants. I'm sure that there are brothers and sisters to those cute little newborn babies who would love to have a matching blanket. What do you think? Aren't they fun!!? 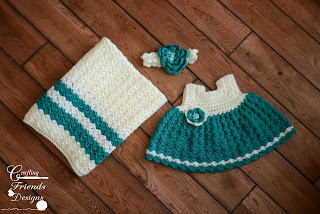 This collection is great to have on hand to whip up some amazing handmade Baby Shower Gifts or to make as service projects.